Is this like the "2018 Roadmeets" thread? I actually might be able to do the great Washington traverse in June/July. Highly unlikely though due to my upcoming college carrer and my parents likely not being able to afford it. No. Someone’s roadtrip will usually have nothing to do with a roadmeet. Personal examples: I’ve never attended a roadmeet, but this year I had three roadtrips, one a 2499-mile drive focused on a business meeting my wife attended near St. Louis (driving instead of flying allowed us to visit multiple friends on the way home) and the other two were trips to Florida to visit relatives. Nothing set in stone, per se, but may explore the old National Road in Indiana and Illinois, or old Route 66 in Oklahoma and Texas. Also continue my research on US 71 and its connection to the Jefferson Highway. There are some old sections of US 62 west of Lawton, OK I want to investigate as well. I plan on attending the Shreveport Road Meet and the Jefferson Highway Conference. I may try to go to the Route 66 conference in Shamrock Texas, but I'm still on the fence about the RMCA meet. Other than that, probably lots of day trips or overnight trips to random locations. A thought that hit me while I'm laid up (for those who aren't friends with me on Facebook, I'm down with another gout attack in my knee and can't stand or walk) -- I think it was last year that we had a thread about tracing your state's borders by highway. I extensively researched how to do that for both inside and outside of Kentucky. I think it would be neat to start at at a certain spot -- say, the intersection of US 23 and KY 8 in northeastern Kentucky along the Ohio River) and trace that route inside the state, then when I arrive back at the starting point, cross the state line and do it on the other side of the border. Then I realized how unpleasant some of that drive would be -- namely trying to get around the KY-WV-VA tripoint in the neighboring states, and just how much I don't like US 52 between Horsepen Mountain and Iaeger, or the section of VA 63 outside Haysi that's required -- and thought "maybe not." Still, it would be fun to take GPS tracks of each route and see if anyone could tell what was being outlined just from looking at them. I have considered a similar thing for NY, either doing the closest state/US route or Interstates or just the closest through road parallel to the border. The former is MUCH easier than the latter, as long sections of NY 5, 17, 18, 22, 25A, 27, 97, and 417 are the closest thing to the border. Though in the vicinity of Elmira/Waverly, a ton of backtracking is required to avoid entering PA because of NY 17's short dip south of the border. This is the route required to avoid entering PA while staying on state highways. Another funky maneuver is required to avoid the section of NY 120A in Connecticut (and the level of funkiness depends on whether you consider the SB side of the section on the state line south of the Hutchinson/Merritt Parkways to be in New York). Regardless of how I did it, it would take a few days and probably a good 2,000 miles or so of driving. Unpleasant? Certainly, as a large amount of looping is required to get the borders of Long Island and some of the Lake Ontario peninsulas, but it would be interesting. No. This is for any road trips, the meet thread is for just roadmeets. I'm planning on a couple of one-day clinching trips to finish up Region 9, so mostly focusing on Tioga County and western Broome County, but will also net me everything in Chemung County and dip into Tompkins County (and hopefully grab a piece of NY 12 that I've only seen at night in the daytime). Both are weather dependent, since they're planned to take advantage of the three day weekends around Martin Luther King Day and Presidents Day. In April I'm hoping to attend the CSVT meet, which would allow me to clinch a few things in northeastern PA. Current plans call for this to be a weekend trip. The week before Memorial Day is my cousin's wedding in Jacksonville, FL. Naturally, I'm planning on driving. I'm thinking of heading down to Key West while I'm there, and then head back further west to minimise deadheading. Here's a VERY approximate version of the route I'm looking at. It runs straight into my usual trip to visit family around Memorial Day. I don't presently have anything planned after that, and likely won't until the NY state budget is done (I'm getting worried by Cuomo's talk of the deficit). I usually do some kind of clinching trip on Black Friday, and the July 4 holiday looks like a good opportunity for one or two as well. I also like to have a fall weekend roadmeet (though that didn't happen this year). I mapped out Missouri's border route (including SSRs) in depth and then saved it to the computer. But it would be a grueling drive. I think I deleted the file a little bit ago. the meet thread is for just roadmeets. Like grilled skunk on toast. No, wait, that would be roadmeat. 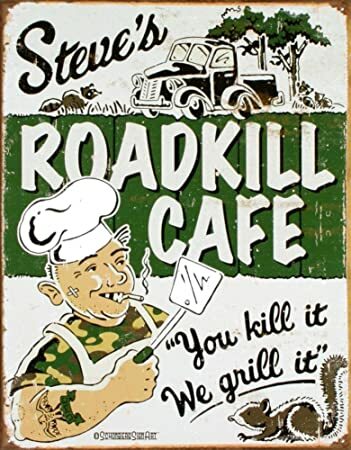 How did I not realize until just now, reading your post, the roadmeet→roadmeat→roadkill connection? We should totally have a roadmeat roadmeet. Oddly enough, I recall a discussion about the roadmeet/roadmeat connection at the Watertown meet. I'll take one roadmeat on wheat, please. With cheddar and mayo, preferably. I'd like that, I definitely plan on doing at least some hiking on this trip, It all depends on how much spare time I've got. I think I did pretty good with planning out my stopping points for each day, so as to give myself enough of a time cushion to actually stop and see places. On a more serious note, you’d be surprised how much roadkill is on US 40 in northwest Colorado. The last time I was on it, I must have passed more than 30 dead mice, rabbits, deer, birds, skunks, etc. It's actually illegal to keep deer or bear (possibly other animals) in New York unless you have a tag for it. I only know that because my dad is a claims agent for an insurance company and he has had multiple clients upset that they can't mount the bucks they hit. In West Virginia, perhaps, the line gets really blurry. There ain't no party like the Donner Party. Technically, hit-and-runs where the pedestrian dies could be considered this. We had one here in northeastern Vermont right after Thanksgiving. Can always freeze it till Christmas.